Need remote control codes for your Promac TV? 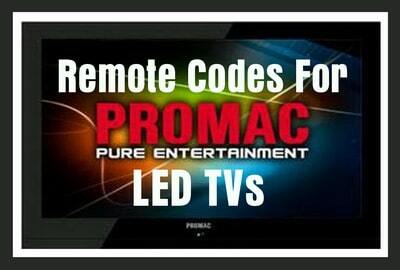 We have a list of all known and working remote codes that will work with Promac TVs. The remote codes for Promac are 3 and 4 digit remote codes. The remote codes will work with all universal remote controls. If you have any issues with the Promac TV remote codes not working, feel free to ask a question below and we will be happy to help. Need help? Here is the PROMAC website with phone call centers to ask questions about your TV remote and finding codes. Have any questions about programming a universal remote to a Promac TV or need another remote codes? Please leave your question below and we can assist you further.